Add instant glamour to your look with this breathtaking drop earrings and pendant set. 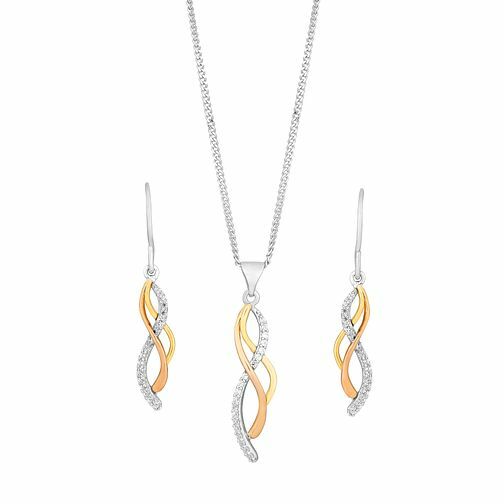 Crafted from sleek sterling silver with accents of 9ct yellow and rose gold for a contemporary contrast, this pretty jewellery set features an elegant twist figure of eight style design partially encrusted with shimmering cubic zirconias for sophisticated sparkle. Silver & Gold Cubic Zirconia Twist Earring & Pendant Set is rated 5.0 out of 5 by 1. Rated 5 out of 5 by Anonymous from Great product Good quality, well described just as nice as on the picture.